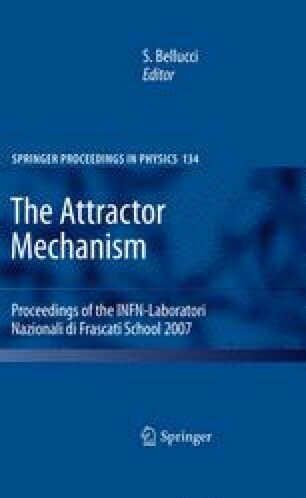 These notes are based on lectures given at the Erwin-Schrödinger Institute in Vienna in 2006/2007 and at the 2007 School on Attractor Mechanism in Frascati. Lecture I reviews special geometry from the superconformal point of view. Lecture II discusses the black hole attractor mechanism, the underlying variational principle and black hole partition functions. Lecture III applies the formalism introduced in the previous lectures to large and small BPS black holes in N = 4 supergravity. Lecture IV is devoted to the microscopic description of these black holes in N = 4 string compactifications. The lecture notes include problems which allow the readers to develop some of the key ideas by themselves. Appendix A reviews special geometry from the mathematical point of view. Appendix B provides the necessary background in modular forms needed for understanding S-duality and string state counting. These notes are based on lectures given at the School on Attractor Mechanism 2007 in Frascati, and they make use of the material prepared for a one semester course taught at the Erwin Schrödinger Institute as part of a senior research fellowship in the academic year 2006/2007. I would like to thank Stefano Belluci for inviting me to lecture in Frascati and to publish these notes as part of the proceedings. I would also like to thank the ESI for its great hospitality during my two stays in Vienna. The participants of the lecture series in both Frascati and Vienna have helped me to shape these notes. A special thanks goes to Maximilian Kreuzer and his group for their active participation. The material presented in these notes is to a large extent based on work done in various collaborations with Gabriel Cardoso, Vicente Cortés, Bernard de Wit, Jürg Käppeli, Christoph Mayer and Frank Saueressig.